Klein Forest High School is located in Houston, Texas. Our student body is about 3,700 students; our faculty and staff total approximately 500, and we are 1:1. We have an on-campus repair center that services our devices, but they do not teach teachers and students how to use software. That’s where we step in. As the instructional specialists in technology on campus, it is our responsibility to ensure that teachers and students can utilize the technology effectively for teaching and learning. 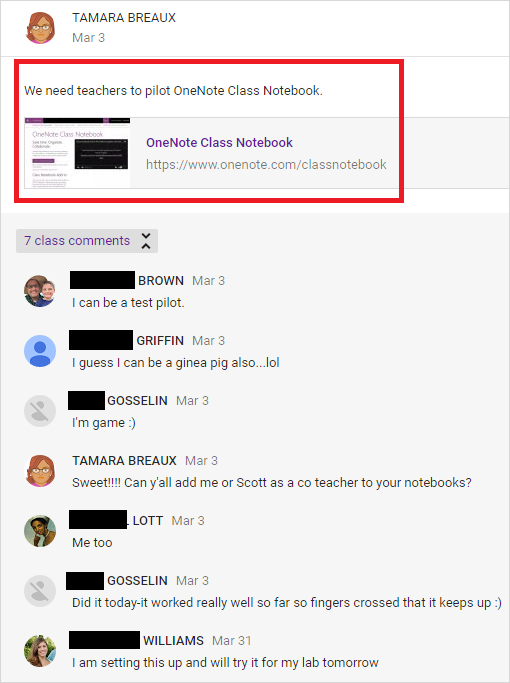 We first saw OneNote Class Notebook while attending the TCEA annual technology conference last February. We attended an amazing session called Personalizing Student Learning with the OneNote Class Notebook. We were in love with so many features of the class notebook, but what sold us was Learning Tools because of our high English Language Learner (ELL) population. As our campus struggled to step away from excessive paper copies in our 1:1 environment, administrators asked us for solutions utilizing our technology more effectively. We knew OneNote was a perfect solution. Before we could sell it, we had to become experts ourselves. So, we created a Class Notebook for our 13-member, cross-content specialist PLC. Our PLC was a team of guinea pigs. Once we gained confidence in the tool, we were ready to bring it to the staff. Like any school, our teaching staff contains all kinds—from technophobes to tech enthusiasts. Knowing that, we asked a few tech enthusiasts to pilot OneNote Class Notebook with their students. This way we would have tried and true testimonials for our technophobes from within the building. This Sway showcases the use of OneNote at Klein Forest High School. Another staff member, an ELL teacher, used it with his students who are new to the country and learning the English language. He was drawn to the Learning Tools add-in. He saw vast improvements in the students’ writing and language acquisition over time. 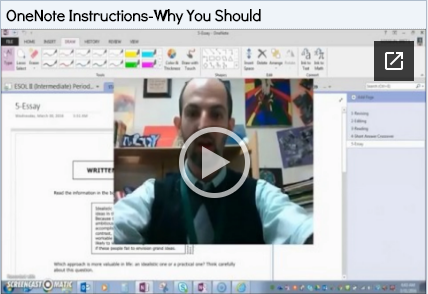 He even made some tutorial videos as a supplemental resource for our teachers ready to jump in. A third staff member, a math co-teacher, used Class Notebook with his SPED students. He, too, liked the Learning Tools, but he loved how easy it was to organize. This proved to be extremely beneficial for his population because it made providing individual accommodations easier. Additionally, the teachers provided us feedback about potential obstacles, which allowed us to anticipate problems and have possible solutions readily available. To prepare for our summer trainings, we decided to actively “promote” OneNote. We visited PLC meetings, made infographics, emailed the details out and posted on our website. During the summer of 2016, we provided professional development for our staff introducing OneNote and had them participate as students using a Class Notebook that we had created. Most of them fell in love with it on the spot. We also had the teachers who piloted OneNote during the previous year assist with staff development for additional buy-in. Once school started this August, things got off to a slower start than we anticipated. Teachers were falling into old habits. Therefore, we decided to switch our approach from marketing to grassroots. We targeted specific teachers who we felt were catalysts, teachers that would share our sentiments. This proved to be successful because—just like we suspected—it spread like wildfire! Teachers and other campuses within our district began contacting us about OneNote daily. Soon, our district’s chief learning officer asked us to do a guest blog post in The Exchange, an in-district blog. As you can imagine, we were pumped. OneNote has been an excellent tool for our struggling students and co-teach classes. A few accommodations we have seen incorporated into OneNote are Read Aloud, enlarged text, graphic organizers, to-do list and use of calculator. (Did you know OneNote can solve simple equations?) OneNote helps students who may struggle with learning disabilities to keep their work organized because the teacher can distribute the work to their notebooks. Students are not losing or misplacing their work anymore. The differentiation of assignments is also made easy with the Distribute Page tool. Teachers can send out different assignments based on the needs of the students within the same class. Teachers also can watch the students work on their own computers and offer direct feedback during and after the assignment. 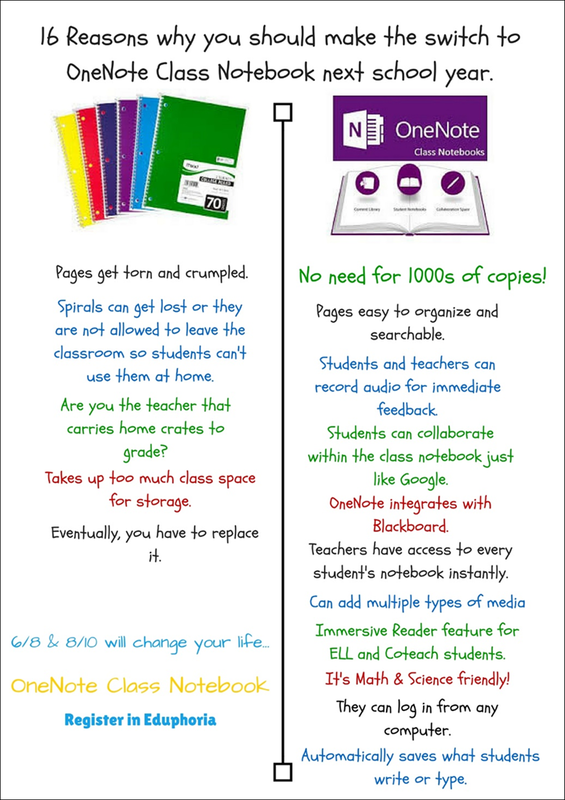 OneNote Class Notebook has been a powerful addition to our technology toolbox. OneNote Class Notebook integrates with many different programs and, lucky for us, it integrates with both our LMS and SIS. OneNote Class Notebook integrates with our LMS, which means it can automatically enroll students in the OneNote Class Notebook—one less thing for teachers to do. Another nice integration is our SIS/gradebook. Our teachers can grade an assignment in OneNote, and with the click of a button, have those grades automatically added to their gradebook. 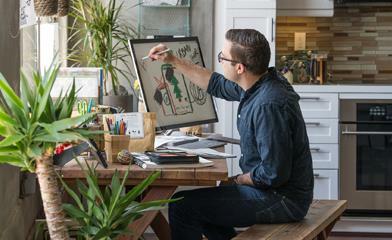 What we have learned in the last 10 months is that OneNote can work for everyone. We have just about every subject represented, from our math teachers to our dance teachers. We have also learned that initial and follow-up support are important for continued success. There are so many awesome features in OneNote, and it can be intimidating for some when trying to show them everything up front. We try to scaffold them as we continue to follow up with our teachers. Without a doubt, OneNote has positively impacted our campus instructionally, for teachers and students alike.